is a full professor of environmental history at the Faculty for Interdisciplinary Studies of Klagenfurt University. is full professor for environmental toxicology and isotopic methods at BOKU. Soils perform a variety of functions. Soils are the basis of food and other biomass products; they provide crucial resources; and they store, filter, and transform materials (such as water) that are vital for life. Soils are a physical and cultural environment for humankind, a natural habitat, and they sustain the largest gene pool in the biosphere. Pressures on soils are increasing dramatically. Soils need to become central to global change discussions in order to advise policy makers in their understanding of the potentials, limits, and vulnerabilities of soils. In particular, strategies for sustainable management of soils in a rapidly changing world require a better understanding of soilhuman interactions. Human impacts on soils are complex and site specific; resulting in pressures on biodiversity, water availability and quality, and the atmosphere. Our rapidly increasing needs for food and energy place growing and conflicting demands on soil. Development issues, food security, nature conservation, our dependence on fossil fuels, social inequality, and armed conflict all have a bearing on soils. 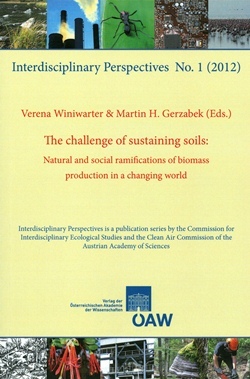 This volume is a truly interdisciplinary attempt to offer an overview of the natural and the social side of the challenge of sustaining soils. 21 world-renowned experts from a wide range of backgrounds review the existing knowledge from which an integrated assessment of the challenges ahead emerges. Soils and societies are linked in a historically and geographically wide-ranging overview that allows readers to understand how deeply-rooted current problems are, but also offers a perspective on potentially sustainable solutions. The links of soils and atmosphere are described with respect to biomass production and global climate change, which are considered together. How the agrofuel option has been transformed into EU policy and how this policy in turn transformed and continues to transform European and African land is another topic, which is discussed in depth. In this book, soils are put centre stage in the debate about global climate change and biomass production, which influences considerably the evaluation of sustainable options for the future.